With the divorce rate what it is in this country, I find it amazing how unrealistic and even lame the general societal response still is to the issue. On one end of the spectrum, you have the “What We Don’t Talk About Doesn’t Actually Exist” crowd. They believe denial is the best way to deal with a problem, or something really sad. While they’re at it, they’re busy teaching their kids this handy technique, too. Then you have the “A Bit of Your Drama Adds Spice to My Life” crowd. They like to hear about a divorce from someone other than the divorcee, shake their heads sadly in an overly-dramatized fashion, feel sorry for the poor poor children, and then spread the news as dramatically and often as they can. As a Christian who has been divorced, I get especially worked up about the range of responses from other believers. Christians certainly fall into the previous two categories, but they also introduce a couple of special sub-categories: the Judgmental This Would Never Happen To Me approach, and the Enlightened This Would Never Happen To Me approach. Everyone’s probably more familiar with the judgmental take than the enlightened one, so I’ll share an example. I recently read a post at a blog I enjoy, Stuff Christians Like, called “Getting caught off guard by divorce.” The blog is meant to be funny, of course, and I don’t really have a problem with this post. In fact, I’m really glad he wrote about divorce. It’s some of the 100+ reader comments that get me worked up. Many of these people are proud of their ability to look divorce in the eye, yet are clinging to over-simplified prevention methods that are actually offensive to people who have lived through a divorce. “Love isn’t a feeling, it’s a decision.” “Just remove the word ‘divorce’ completely from your vocabulary.” “Divorce won’t happen if Christ is at the center of your marriage.” You get the idea. Ugh. So what’s a never-been-divorced person supposed to do? I realize it’s awkward and nearly impossible to know what to say to someone who is going through a difficult experience that you’ve never gone through. What would I say to someone whose spouse died? I have no idea. I can, however, share some insight about divorce. - Acknowledge it for what it is: a very horrible, painful and sad process with effects that ripple out and lap up against people for years. - Don’t over-simplify it, or judge it, or think you would have been able to prevent it. Everyone’s marriage, healthy or dying, is more uniquely complex than anyone else can imagine. - Take it seriously while keeping in mind that it’s not the end of the world. The messes we make can be redeemed, and turned into something good—even beautiful. 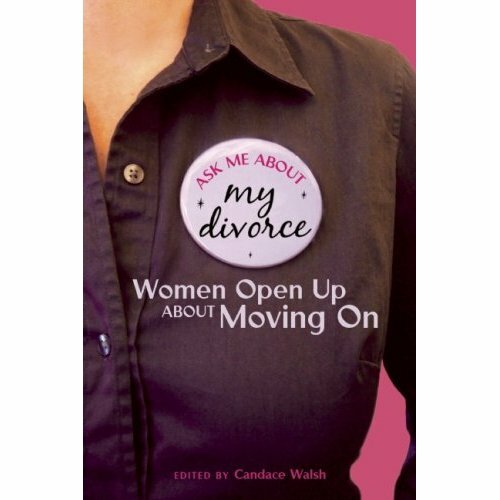 Just as I was learning to embrace that last point in my own life, I submitted an essay to the book Ask Me About My Divorce: Women Open Up About Moving On. It was accepted, and will be published in June. What appealed to me so much about this project was the way the editor, Candace Walsh, approached the topic: Even if divorce is not at all what you had in mind for your life, it can be an escape hatch into a better life. By being published in this book, I’ve joined a community of women who all share this positive, hopeful, life-affirming perspective on divorce. Connecting with these women has been amazing. And I think it’s just that perspective that’s too-often missing in people’s understanding of divorce—whether they’ve experienced divorce or not. It was as if I’d been swimming the English Channel for months, miserable, cold and lonely, and suddenly there to pull me out was a crowd of beautiful, laughing women in dripping bathing suits, telling stories. every friend I had in L.A. when I got divorced is either no longer my friend or left and trust me when I say that 98 percent of them just walked out of my life. I have a sister who now won’t speak to me b/c she blames me for leaving the marriage. Nice huh? So, this is coming from a perspective of someone who has been through his parent’s divorce, as I am not married myself (yet). It is an extremely difficult thing for a child to go through – and I’m sure most people with divorced parents will say the same thing. My parents divorced when I was very young (six) but I still feel the effects of it. I still have to ‘choose’ who to spend holidays with, there is a constant unavoidable feeling of disappointment when I spend more time with one than the other – it’s tough. I’m 23 and it’s still tough. But in the end – I know that it was the best thing for them to do, and I know that they never WANTED to hurt me in the process. Some of the things I had to go through, the (multiple) custody battles, etc – they weren’t easy. Basically having to tell one of your parents you don’t want to live with them – it’s not easy. Divorce is something I hope I never have to go through – it’s something no one ever plans on going through – but I know that it’s inevitable in some instances, and people can rebound and become stronger from it. I love your thoughts and your perspective! I am a Divorce and Life Reinvention Coach and founder of the D Spot, LLC! I support women to regroup, renew and reinvent themselves before, during and after divorce. Awesome! As someone who has never been divorced but has been through divorces with siblings…I know the toll it takes on the whole family. Your perspective is hopefully but realistic. I love that! On another note, my parents were married to other people before they met each other. I thank God often that they divorced and found each other. I wouldn’t be here otherwise! Growing up the child of divorced parents, I never could have imagined one day being divorced myself, much less contributing an essay to a book with the bravura title “Ask Me About My Divorce.” Its central message: We can make the best of what life hands us, each in our own unique way, building a better future for ourselves and our loved ones. If you’re reading this blog, you know what a heartfelt, gifted communicator Kristin is. I join her in inviting everyone to find the book’s fan page on Facebook. Think of this as your invitation to an online party celebrating all that is resilient in the human spirit. See you there! I’m glad to hear you have an essay in this book. As soon as I saw you became a fan of the book I tried to find the TOC, but it wasn’t anywhere. Congratulations! I look forward to reading it. Candace, no—YOU rule! Thanks for doing everything you’ve done to make your vision for this book become a reality. It’s going to touch so many people. Jessica, sadly, your experiences are proof that there’s widespread societal confusion, negative stereotypes and prejudice when it comes to divorce. I’m so sorry you have to deal with that aftermath every day, but I hope you’ve found (or will soon find) your escape hatch into a better, post-divorce life. Laura, it’s great to “meet” you! I’m glad you somehow found my blog. Your work sounds perfectly aligned with the tone of this book and the life the women featured in it are trying to live out. I’m looking forward to finding out more about what you do. Robin, thanks for sharing yet another different, wonderful life story that hinges on divorce. We’re glad your parents found each other, too. :) And I think you’re right—the important perspective to have on this issue is one that balances hope and realism. Julie, I truly am SO excited to be a part of this community with you. I never imagined that the relationships would be as rewarding (if not more) as having my words published in a book. And I love your analogy: “Think of this as your invitation to an online party celebrating all that is resilient in the human spirit.” Perfect. Natalie, thanks so much. I must say, it means a lot to be connected again to a few people like you who knew me well in my “other life” (ie: first marriage), in another city and state. Sometimes all of these parts of my story seem so disparate that it’s hard to see how I’m one person through them all, living one complicated but cohesive life. In a small but meaningful way, you commenting on my blog makes a difference. That is a great accomplishment to have your essay accepted, KT. I hope I can pick up a copy. I wrote an essay about my divorce in 2002. Actually two different essays. 1: When the White Picket Fence Burns Down and 2: To Teeter On Ararat. I’ve been publishing some of my original open diary web log entries on my blog. I haven’t made an issue of it. It’s mostly for my children – to get a glimpe of me at the dawn of 30. Not much about the divorce there now – if ever. I can’t even begin to respond to the sheer audacity of that reader comment. His ways are higher than our ways, and His thoughts, higher than our thoughts. Thankfully it is so and I rest daily in His understanding. Congrats to you on getting an essay in the book! That’s a great achievement. I didn’t come from a divorced family but I thought my parents were going to get divorced when I was about 10. Even just having my Dad move out for a while was traumatic. I can’t imagine what a full-on divorce does to a child, much less the parents. Good for you for writing about it and being able to face your demons. Congratulations on your essay being included in the book. That’s great! My husband was married before, and despite all the pain it caused he has said many times that the whole divorce experience helped he grow closer in his relationship with God. Approaching something as painful and devastating as divorce with a spirit of hope and faith is, in my opinion, exactly what it means to be Christ. I’m excited to read it! jenx67, I would love to read your divorce essays. Those are great titles! It is an interesting question: What will we want our kids to know about our divorce (in terms of details), and when are they ready for that? Re: the reader comment, I assume you’re referencing the “if Christ is at the center of your marriage” one? As if any couple is able to truly have Christ is at the center of their marriage! Because we can’t achieve that perfection, I guess he’s essentially confirming that everyone is susceptible to divorce? Ashley, thanks! Being able to write about my divorce is the most therapeutic thing I can do. I wasn’t ready to write about my divorce until some time had passed, though—a good three or four years. Writing usually helps me work through things, but in this case I’m glad I had to get some distance and perspective on it before I was able to write. OMG….that blurb from Marion Winik immediately brings tears to my eyes, which always means there is something deeply TRUE about it. Whether the subject is divorce, stay-at-home-vs.-working-outside-the-home or what it means to be beautiful, the biggest, saddest mistake we as women ever make is to back ourselves into a corner and make a horrible little wall out of our opinions, misunderstandings and fears. These walls make us feel better, as though they will make us immune to tragedy, pain or loss. “If we hate divorce (or whatever) enough, it won’t happen to us,” we say from behind our walls. But if we are without fear, we can push over our walls, step out from our corners and meet one another in a lovely circle of women. We can ask questions, we can tell the Truth, we can comfort and embrace fellow humans with human pain, we can speak our fears and we can find common ground. Why would we NOT want to do this? I can’t wait to read this book. Congratulations for being a part of it! Cheryl, that’s exactly how I felt when I first read the Marion Winik blurb. Why is that? What’s so raw and moving and true about it? I think you touch on it, in your comment: we all have fears, but it’s possible to “push over our walls, step out from our corners and meet one another in a lovely circle of women. We can ask questions, we can tell the Truth, we can comfort and embrace fellow humans with human pain, we can speak our fears and we can find common ground.” Beautifully put. Thank you. I left my husband of 4 and a half years after putting up with physical and emotional abuse (which started with him punching me on our honeymoon) and then deciding that I’d rather kill myself than live with him any longer. As a very staunch fundamentalist Christian (at the time) it was the very hardest decision I have ever made in my life. I just knew that I didn’t want to have children with him and make their lives hell too. My family were utterly devastated, and my parents and several siblings didn’t speak to me for two years. That all happened five years ago, and I’m slowly patching things up with my family, but it’s taking a long time. I’m no longer a christian – the idea of worshipping the God that my parents worship is repugnant to me. Their religion meant that they turned their backs on me at a time when I desperately needed their love and support, and I don’t know that I’ll ever completely get over that. Keren, thanks for sharing part of your story. I’m so, so sorry you’ve had to live through this nightmare, and that the aftershocks are still reverberating in your life. As a Christian, perhaps nothing makes me more angry than Christians using their religion as an excuse to treat others unjustly, void of the love or compassion that Jesus modeled every day. When those Christians are your family and friends, it’s horrific. I do hope that you’ll get a chance to read my essay after the “Ask Me About My Divorce” book is published in June. It tells about my own anger toward God, church, and many Christians during that time. It also tells how I thought I was done with God and with the institution of marriage for good, but I eventually found myself embracing both again, in completely new ways. I realize, from experience, that no one can convince you of anything—and certainly not me, whom you’ve never met. You have to work through it all in your own time and your own way. I do want to say, though, that your parents’ expression of Christianity does not sound like it’s based on how Jesus treated and loved people. I hope you will not let them define your understanding of the faith forever.